You can charge water with GaNS in two different ways to obtain liquid plasma (LP): by physically mixing it with GaNS and by exposing it to GaNS without physical contact. When we create liquid plasma, we allow water to essentially be mixed with the actual GaNS material. In this instance, the GaNS creates a ‘copy’ of itself as an energetic imprint onto the water. We call this Multiplication of LP; you can find the instructions above. When you use this water, you are taking the energy of the GaNS, but in a slightly weaker form that the body can easily use. However, this form of energy is of a much higher strength than the body, and so can help alter the overall balance in the body over time. We can use this water for drinking or bathing, spraying or nebulizing. One must remember however, that this water will lose the energy over time maybe weeks or months at most. This means that if you use it to make devices, the strength of the device cannot be retained for long and will need to be replaced. In this method we do not let the GaNS material come in direct contact with the water; the water is charged just being in the physical vicinity of the GaNS material. The water is therefore energized at a much slower rate, my tests show around 48 hrs. Via Sano and PlasmOtotal work with this method. Also, the filter created by the glass or plastic does change the end result in the energy of the water. The water has a slightly lower strength level and may not be exactly the same as the liquid plasma. It will also lose its fields to the environment at a much quicker pace, probably within days or weeks, depending on the environment and how much energy it is losing by giving off fields. 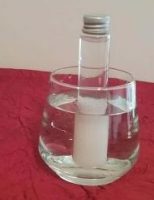 This form of energized water can be used for general home use, but cannot be assumed to have the qualities of the liquid plasma, and if used in any device, can also NOT be assumed to have enough field strength energy to have an impact on any severe health issues. It must be assumed to have transient energies which will be lost quickly. REMEMBER – With Plasma, the stronger feeds the weaker, so make sure what you use is strong enough to make an impact. For example, if your body is working at an energy level of 4 out of 10 and we give it some 10 out of 10 fields, the balance point reached will be at around 7. We are making these numbers up here, just for illustration. Now your body can work at the higher energy level of 7. At this higher energy level the body may be able to change it’s condition and treat the imbalance. If, however we gave it fields of 8 out of 10, the balance point would be at 6. Is this enough to create the outcome you want? All energies are not created equal, which means you must understand how to work correctly with your GaNS to have the outcome you would like. Create through knowledge and you will get the correct result. IMPORTANT: Do never ingest or apply GaNS directly on the skin; only use GaNS water – it will be way to strong!